NiQ Health and ELA have a successful, long-standing partnership and ELA has been at the forefront of new CarePlus™ products installation. They have successfully installed CarePlus™ Antimicrobial call points into Saint John of God Geraldton and Bunbury Hospitals, and new refurbishment projects. ELA (Electro Acoustic Co. Pty Ltd) has over 40 years’ experience in designing and integrating electronic systems, with a strong focus on nurse call systems, healthcare applications, audio-visual, patient entertainment and security systems. Since 1971, ELA has provided product integration and support services to extensive healthcare customers in Western Australia, including public and private hospitals and aged care facilities. 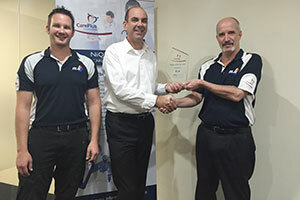 The team at NiQ Health appreciate ELA’s effort and determination to achieve this award and look forward to continued success and growth of CarePlus™ partnership with ELA.